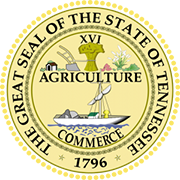 Being the chartering agent for corporations and business entities, the Secretary of State of Tennessee also maintains a business corporation register which holds records of every corporate entity that are incorporated in the state. All the filing and authorization details of the entities headquartered in the state are stored in the same registry for reference. The registry acts as the recorder for the following types of entities that are registered with the Tennessee SOS. You are at the right place if you are looking for registered entities in the US state of Tennessee. 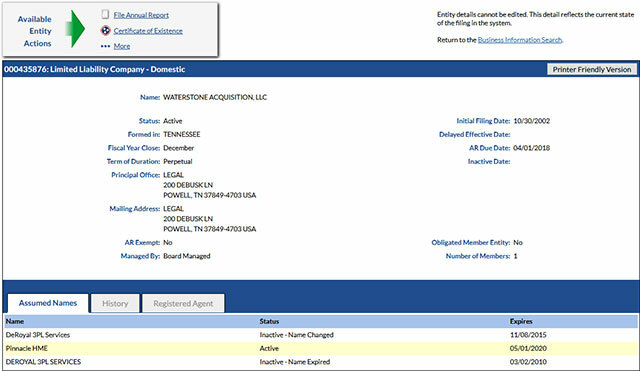 Here we will guide you towards searching for a business entity in the online database of the Secretary of State of Tennessee. The online business search tool facilitated by the SOS is a great tool to find details of corporations and business entities in the state. Below is a step by step guidelines on how to use the Tennessee business search tool. 1. The first step is to access the Tennessee business search page by clicking here. The search page looks something like the screenshot below. 2. The business search page allows you to search by name and control number. They also provide the option to search only entities with the status of active. If searching by name, they have the option to search by name that starts with or contains to help widen or narrow your search. For this example we will search by name, go ahead and type "DeRoyal" in the "Search Name" field. Then select the "Starts With" option. Next, you will need to click the "I'm not a robot" box to verify you are a human using this form. Once you have done that, click the "Search" button as shown in the screenshot below. 3. Once you click the "Search" button, it will then display a list of results that match your search criteria. It shows the control number, entity type, name, status, filing date and status for each business entity displayed. 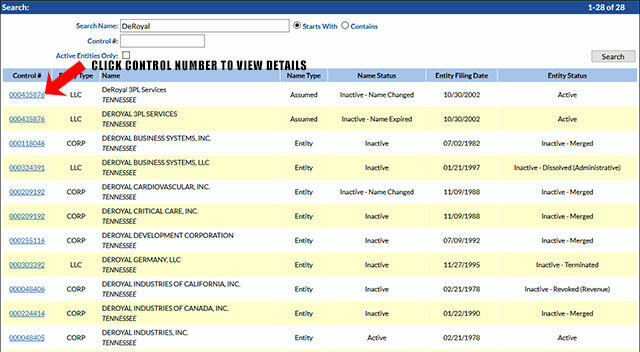 To view details for a business, click their control number, shown in the screenshot below. 4. When you click one of the business entities control number, it will display the details for that business. This page shows you the name, status, filing date, mailing address, history, agents, documents you can download etc. The screenshot below shows this. The Secretary of State of Tennessee is an elected post within the US state of Tennessee created by the constitution of the state. The Tennessee Secretary of State is one of the three constitutional offices in the state of Tennessee other than the Governor of the state. The office holds no constitutional limits of terms of how many times one can be selected to this post. The current office holder is Tee Hargett.